Like other prestige manufacturers, Lincoln needed a more moderately-priced car to help it endure the tough times of the post-Depression era. 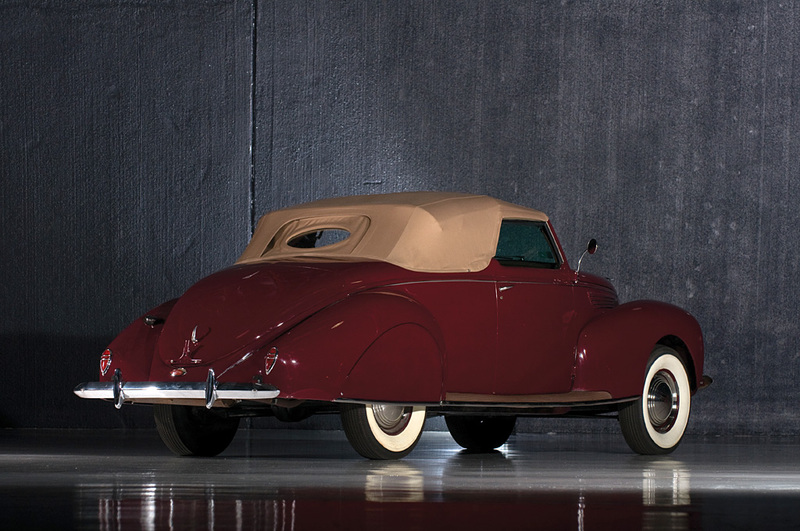 It responded with a November 1935 introduction of the Zephyr for the 1936 model year. Its streamlined teardrop styling was credited to designer John Tjaarda of the Briggs Body Company with help from a young Ford designer named Eugene T. “Bob” Gregorie. Its name echoed that of the new-fangled streamlined modern diesel trains in operation on the Burlington Railroad. The trio would be credited for fashioning the first successful streamlined car in America. The Zephyr was powered by a new, small V12 engine derived from the standard Ford flathead V8. Despite the advanced styling and novel V12 engine, parent Ford Motor Company was never happy with sales; yet of 18,994 Lincolns sold in its first year (1936), 17,715 were Zephyrs, arguably keeping the Lincoln division of Ford Motor Company alive. In its third year, Lincoln would produce 19,111 units including just 600 of this 6-passenger two-door Convertible. Production of the Zephyr would continue through 1948 (excluding 1942-1945), though the Zephyr name would be dropped in 1947. 1948 would mark the model’s final year of production.